Whether you want to monitor temperatures in your coolers and freezers or track temperatures in your building, Monnit's professional temperature monitoring kits make it easy to start. 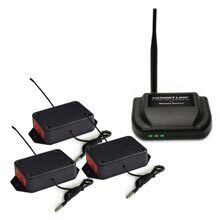 The professional Ethernet temperature monitoring kit includes everything you need to start monitoring temperatures remotely using your existing onsite Internet connection (connects into Internet router via Ethernet cable) and comes with three AA powered temperatures sensors with 3 ft. probes. Monnit wireless sensors and online monitoring software will alert you of any temperature issues in real-time, helping you maintain effective, optimized operation. As part of our July 2016 web special, you can also save 10% on Monnit Ethernet Gateways making this the perfect time to get started with a Monnit temperature monitoring solution. For more information on this web special, visit www.monnit.com/web-specials. 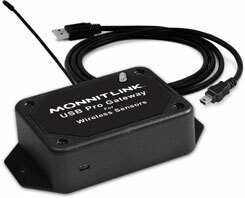 The MonnitLink™ USB Pro gateway allows your Monnit Wireless Sensors to communicate with the iMonnit™ online wireless sensor monitoring and notification system or Monnit Express™ standalone PC software. Simply plug the device into an available USB port on a Microsoft Windows PC. If the PC has an active internet connection and you wish to use it with the iMonnit online software, install the Monnit Gateway application to pass sensor data to the online system. If you would like to use your wireless sensors locally (collect and store sensor data on your PC), install the Monnit Express standalone software, and all sensor data will be stored in the software's database. The Monnit Express software allows you to export sensor data in a .csv format spreadsheet and is also capable of sending SMS text and email alerts if the host computer has an active Internet connection. • Optional RS232 DB9 communication port. • USB powered (optional RS232 or external power). • Uses standard FTDI driver so no driver installation is required. • Supports up to 100 wireless sensors per USB. • Windows 10, 8, 7, and Vista compatible. "From concept to deployment, using Monnit's sensors made our last project the easiest and quickest we have ever done. 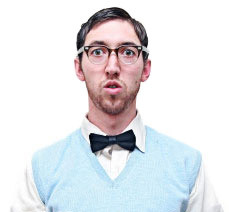 Their customer support is top notch and most importantly, their stuff works like it should!" We are proud of the relationship we have developed with our customers and partners. These relationships allow us to continually improve our products and services based on our customer's needs. We have had a number of requests for a sensor that would provide the ability to track and count people. 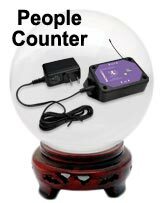 The Monnit development team is currently developing a people counting sensor. This new sensor would be ideal for commercial buildings, malls, movie theaters, public areas and other applications where you may want to track the amount of foot traffic to and from selected areas. If you would like to learn more about the development efforts of our team on this new product or to be notified when it becomes available, please email us at sales@monnit.com. Damaged inventory and employee safety issues occur everywhere; from small business storage areas to million-square-foot best-in-class warehouses. Identifying issues in these facilities is part of the process to decrease or eliminate problems altogether. Let's face it, running a warehouse takes a lot of time and energy. Warehouse management is confronted with various challenges that many companies fail to embrace fully. Imagine having to locate hundreds upon thousands of products that you have to ship to your customers within a timely manner, while preventing damage to stored goods and the building infrastructure, and monitoring the performance and safety of your facility and team. In the past, these obstacles were difficult to manage, but thanks to Monnit, that has changed. 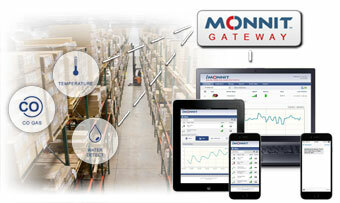 Monnit enables warehouse managers to monitor and track various conditions of their equipment, building, and stock. For a long time, available solutions were very limited, expensive and difficult to use. Monnit's affordable remote monitoring system makes it easy for owners and managers to keep track of their business from anywhere, at any time via computer, smartphone or tablet and receive alerts via text, voice, email, or through a local alert system the moment there is an issue. Temperature Sensors Protect workers and inventory from heat-related issues. Water Detection Sensors Prevent mold, mildew and water damage to building and inventory. Open-Closed Sensors Be alerted if shipping bay doors are left open. Carbon Monoxide Sensors Keep your employees safe from CO poisoning. Average Cost $500-$600 for a gateway and 4-6 sensors. Typical Setup Time Less than 15 minutes. Battery Life Up to 10 years. 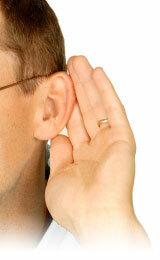 Benefit Knowing about issues in your warehouses as they happen. Protecting your employees from hidden dangers. All Monnit wireless sensors come with free basic online monitoring, allowing you to view sensor information anytime from anywhere. Receive instant notifications via SMS text, email or voice call if a user defined conditions are met or exceeded. 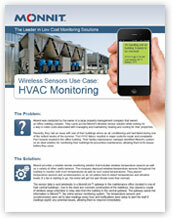 Protect Your Warehouse and Employees with Monnit Wireless Sensors! To get started, we suggest a Monnit HVAC Monitoring starter bundle as it will include all the devices needed to monitor one HVAC system remotely. Bundles can be purchased here. Alternately you can purchase the devices separately if you wish to use a different gateway or different versions of some sensors for the indoor portion of the installation. Before starting any part of this installation process, shut the power off to both the condenser unit and the inside air handler unit. For the indoor portion of the HVAC monitoring system, start by installing a Monnit wireless gateway. The gateway can be located anywhere in the building where it has access to power and a decent cellular signal (for Cellular gateways) or access to an internet router (Ethernet gateways) or PC (USB gateways). For indoor sensors, we recommend using a wireless duct temperature sensor to monitor the output ventilation air that is being sent from the air handling unit back to the building and a wireless temperature sensor that can be installed near the thermostat or air return, to track ambient room temperature. 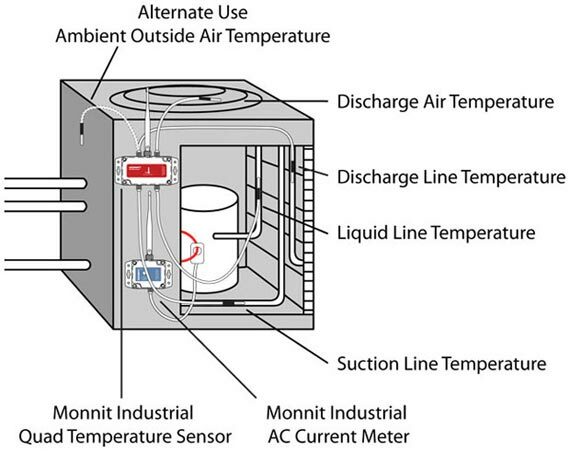 For the outside condenser unit, we recommend using a Monnit industrial wireless quad temperature sensor as it comes in a weather proof enclosure suitable for outdoor use. The quad temperature sensor has four independent temperature probes that can monitor and collect temperature readings for the key areas of the condenser unit. Each temperature probe is labeled 1 through 4. Start by connecting one of the temperature probes to the suction line, one to the liquid line and another one to the discharge line making note of which probe you are connecting to each. When connecting a temperature probe to any of these refrigerant lines, we recommend using a zip tie to fasten the probe securely against the bare metal tube. After securing the temperature probe use thermal tape to wrap the probe entirely to the refrigerant line, this provides a thermal barrier allowing the sensor to get a more accurate reading of the refrigerant line temperature. For the remaining probe, we recommend fastening one to the fan grate to capture the discharge air temperature. Alternately you can use any of the probes to capture outdoor ambient temperature if you prefer. We also suggest using a Monnit industrial wireless AC current meter (150 Amp) to track the current draw of the compressor. The AC current meter uses a clip-on current transformer that should be clipped around the "hot" power wire feeding the compressor. With the sensors installed, you can restore power to the condenser and air handling units. The system will begin tracking data for you. If your AC system is cooling efficiently you should see an average difference of 16-19°F (in humid areas) and 19-22°F (in dry areas) between the intake air and outgoing air returning to the building. When monitoring current consumption of the compressor, an increase of current being used signifies that the compressor may need to be serviced or replaced. All trademarks are property of their respective owners. © 2016 Monnit Corp. All Rights Reserved.